in the capital of Norway. and naturally psy trance will be represented. until the 31st of January. ticket will cost 30 euro. Unknown Cause is Magnus S. W. from Oslo, Norway. His music can best be described as adventurous, mellow but rich and spacious, vision translated to sound… Unknown Cause has played in the deep forests of Norway, the peaks of the Altai Mountain-range and the basement of the Empire State building, so these mysterious sound waves have travelled far and beyond. Unknown Cause is currently working on his debut solo-release with the label Tie&Tail, due late 2013. (né Ringström), both born in 1976 and based in Göteborg, south-west Sweden. forever, whereas Daniel develops the rhythms and sculpts the ideas into tracks. ‘Ultimae’ label in 2002 and have since released four official full-length albums. Bjorn Opheim and Stein V. Skjoldal from Stavanger, Norway. labels. Their 3rd album; "Time for solution" is out now!! Onkel Dunkel is the solo project of Monno, member of G.O.W. into a state that is normally not possible to reach in our noisy environments. for action :D open for bookings! stay tuned…i might appear in a forest near you. As to what kinda music i do, i won..t go as far as to categorise my music. Take a listen and judge for yourself. in the most corners of Sweden. 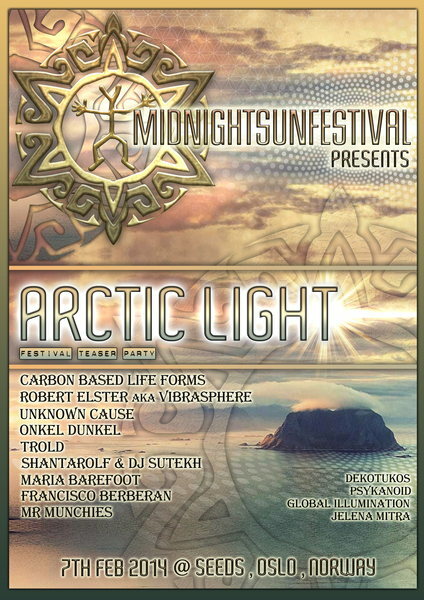 artist manager @ Midnight Sun festival. Behind the name Psykanoid stands psy trance culture enthusiast Patrick Kanerva - currently mostly active in the underground party scene of Western Scandinavia as a dj of predominantly full-on and isra trance. But he is also very busy putting his efforts and creative energy to work into beautifying the party scene, trying to provide the dancing trancers with a buffet of sight and sound savories of all sorts, not only through dj-sets but also with decoration work at parties and painting and creating 3D-deco of his own. He is the inventor, realizer and builder of the underground smoke system that was premiered at Forest Star Festival 2012, a smoke system creating an eerie, supernatural atmosphere to the dance floor. Originally Psykanoid launched his dj-voyage playing techno at a Finnish club in he`s home town around the year 2000, but in around 2005 psychedelic trance became his music of choice. He plays his sets of melodious, atmospheric isra psytrance, energizing, uplifting full-on and the psychedelic mischievous dark-on in underground forest parties and Scandinavian forest festivals such as Spektral Forest in Finland, Burning Man of Sweden and Forest Star Festival. Decotukos is a six handed installation art group from Finland. We have been working within the Finnish psytrance scene for over four years. Officially Decotukos was formed in March 2013. So far we have decorated parties all around Finland featuring artists like Ott, Braincell, Tryambaka, Zoolog, Zeamoon, Talpa, Sensient and many more. Our decorations are colorful, plentiful and cut with extreme precision. We always construct our installations using a special intuitive improvising technique. Our aim is to elevate the events visuality to a whole new level with three dimensional stretch fabric designs. GI's common vision is to combine stunning, original visuals with uplifting messaging. and Boom. Global Illumination is part of the creative team behind the S.U.N. Festival in Hungary. Documenting psychedelic gatherings since 14 years back - all over Europe. Official photographer for BOOM, S.U.N, Ozora, and Mystica. Worked with promotion material for Chromosome, Ticon, Son Kite, Logic Bomb, Ace Ventura, Protonica, Tristan to mention some.